Our Senate won't unite on anything to help America but they will unite on keeping our forever wars going indefinitely. 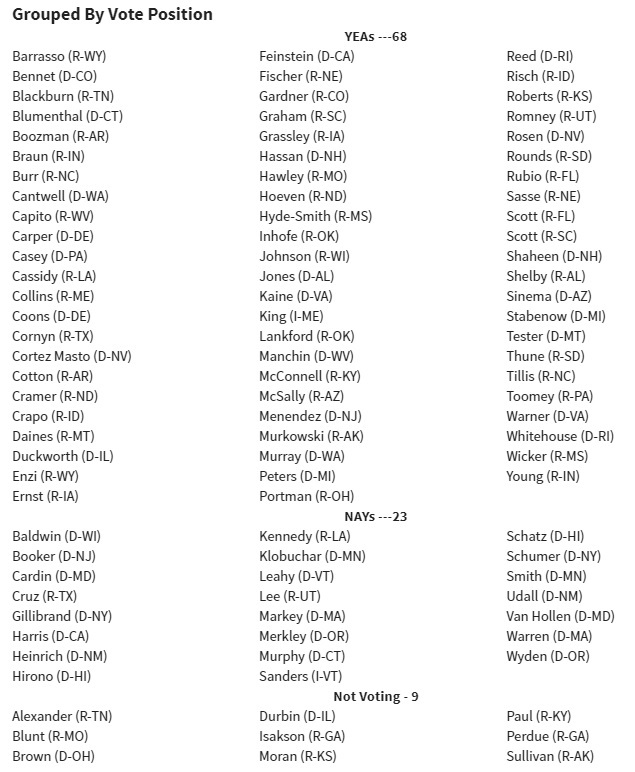 The Senate, in a bipartisan rebuke to President Trump's foreign policy, voted overwhelmingly to advance legislation drafted by the majority leader to express strong opposition to the president's withdrawal of United States military forces from Syria and Afghanistan. It's not just Trump, but the will of the American public who voted him into office to end these wars which was "rebuked" here. The "broader bipartisan Middle East policy bill" is a bill to give Israel $38 billion from US taxpayers and make it illegal for US citizens to boycott the state of Israel. As The Forward reported last month, the ADL said in a private memo that the anti-BDS law which is part of this bill was blatantly unconstitutional and would create antisemitism -- but they backed it anyways. 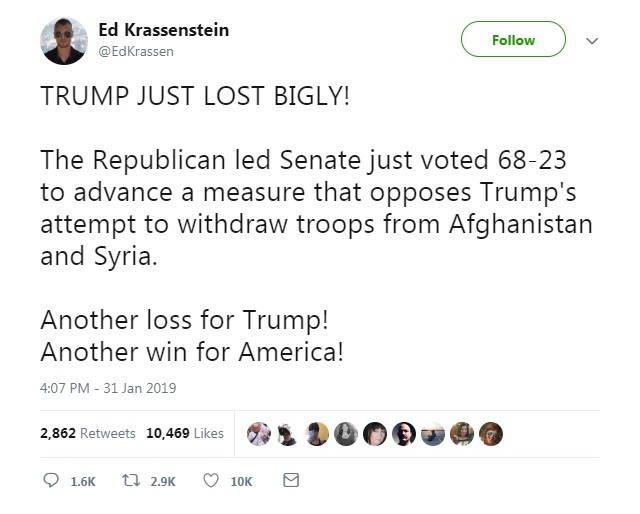 [...]Mr. Trump's declaration of victory over the Islamic State provoked a swift backlash on Capitol Hill in December when he ordered that the United States pull 2,000 troops from Syria and 7,000 from Afghanistan. Mr. McConnell, usually a reliable ally of the president's, drafted an amendment warning that "the precipitous withdrawal of United States forces from either country could put at risk hard-won gains and United States national security." Without directly invoking the president's name, Mr. McConnell countered Mr. Trump's isolationist policies, arguing that "it is incumbent upon the United States to lead, to continue to maintain a global coalition against terror and to stand by our local partners." "I believe the threats remain," he said in a speech on Thursday. "ISIS and Al Qaeda have yet to be defeated, and American national security interests require continued commitment to our mission there." Indeed, the threat will remain in perpetuity therefor we can never leave and actually need to start new wars in Venezuela and Iran -- even though this is exactly what everyone voted against when they voted for Trump. The fake news media, the fake right and the fake "resistance" will cheer it every step of the way. Anyone who disagrees will be smeared as a "Russkie" agent and the president we elected to stop all this lunacy will have everyone around him arrested and charged with manufactured crimes and be browbeat into submission by the entire establishment uniting against him.